Defender or defensive midfielder Steve joined the club under Glenn Roeder, moving from Ipswich Town in 1995 for £135,000. He went on to make well over 200 appearances for the club over six years, including winning Player of the Season as Watford were promoted to the Premier League. He was given a free transfer in 2001 and joined Queens Park Rangers. After a brief spell back at Watford as Academy Recruitment Manager, Steve is now working for the Premier League, and spoke to Watford Legends in 2010 while working at Tottenham Hotspur. Hi Steve. How did you go from being a Tractor Boy to a Hornet? I’ve only been sent off twice in my career and one of them occasions was against Huddersfield, which meant I was suspended when I was due to play against Watford. After the game Glenn Roeder spoke with me and enquired with George Burley about me. During the discussions it became apparent that I wasn’t amongst the overall plans for Ipswich. So by the next week I was a Watford player. Did it take long to settle in the club? No, not for me. When you are a professional footballer it is part of the role that you move and adapt to new circumstances and challenges. 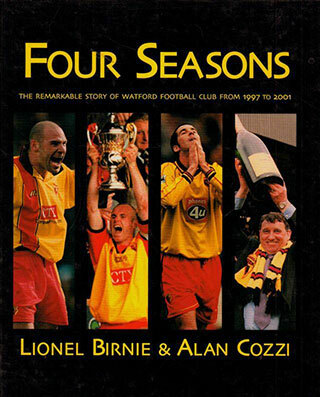 It was a different role in as much as that I was in my mid twenties, and at Ipswich that meant I was a younger player in an older team, but at Watford it made me one of the more senior players, as the Watford team was very young. So there was a shift in my place in a team, and it made me take something of a leadership role. Were there any players in the Watford side that you particularly enjoyed playing alongside? I would say Robert Page. I enjoyed a good partnership with him. I always felt comfortable playing alongside Nigel Gibbs and Darren Bazeley. The emphasis at Watford is always to play as a unit, so I always tried to feel comfortable wherever on the pitch I played. When I first started to play I was a defensive midfielder, and I felt very much at home there. I also played at centre-half as well, but overall I would say the defensive midfield position was where I felt most at home. Although I did enjoy it at the back as well. How did you feel about your relationship with the fans? I think the longer I stayed at the club the more the fans saw what I was about, and what my take on how to play was. By the time I ended up leaving I think I had a great relationship with them. And after all these years do you remember your chant?! Yes of course! Even after all these years I couldn’t forget that! It always made me smile when I heard it strike up. Were there any particular games that were a personal highlight for you? For me it has to be the day at Wembley. For a player like me that was as good as it was going to get. Then when promoted we won at Anfield. So I would choose those two games. You went in to the record books for playing in every available shirt in the season. How did that happen?! I don’t know, but I do know it was not contrived until the last three numbers. I think GT got wind of it and we decided to complete the set. In this era of squad numbers it will never happen again. And you must be in a very small group of players to have done it. I think so. Although I’m not sure how much of an achievement it is in the scheme of things. It’s a nice piece of trivia rather than a grand achievement. Yes, and I would say that those two seasons were my best as a pro. And then to get to the Premier League, although unsuccessful, was very enjoyable. How aware were you at Fulham of events concerning Bristol City in the final game of the season. I was very aware of what was going on as I had to go off after about 20 minutes injured. So I suddenly became very nervous! I was in the stand amongst everyone with their radios and so on. I can tell you that it’s a lot less nerve wracking on the pitch! People were obviously letting you know the score, but would you have looked to find it if you hadn’t heard? No I don’t think so. I think that there is a time and a place to find these things and I think we would have looked at it afterwards. The celebrations afterwards with the Watford fans were great, especially as there was a lot of hype over Fulham that season, so it was nice for us to get a bit of attention. In 2001 the Vialli era started. And that great team started to be split up. How did your transfer to QPR come about? In pure fact terms I was put on the transfer list by Watford and made available to be signed. I’m not sure what a professional way of doing it would be, but as soon as I found out that I was free to go, I was keen to make a move. I didn’t have any conversations with the hierarchy to explain why they wanted me to move on. Your departure from the club caused some discontent amongst Watford fans. Were you aware of this? Not until I went to Watford with QPR in a pre season game. And there I was given a presentation on the pitch from the Watford supporters. And this is why I had, and still have a great relationship with the Watford fans. Do you get to The Vic much? No I hadn’t been until they started the Watford Legends initiative. And since them I’ve enjoyed some games there. Since I have such a good relationship with the Watford fans I am keen to maintain the link. Who are you still in touch with from your Watford days? I speak to Sir Nigel regularly, and speak to many of the others in passing. That’s the nature of football. It has a slightly transient nature to it. And now you’re working for Spurs. Yes I work with the schoolboy players at Tottenham. We have some great facilities there and Tottenham have a great desire to develop younger players. My job is Academy Performance Manager so it is my role to create the environment for the boys to be successful. I have to monitor performance, monitor equipment, and liaise with opposition and so on. And then I coach as well. What would you like to be doing further down the line? I don’t know. The job I am doing now is really enjoyable and it allows me to spend time with my family. For the moment I am enjoying what I do, but who knows what I would see myself doing ten years in the future. Thanks for your time Steve, see you at the home of football soon!